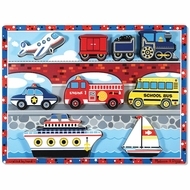 MELISSA & DOUG-My First Chunky Puzzle. This chunky puzzle is perfectly sized for little hands. A picture of each shape is printed on the frame for help in matching and the pieces stand up for pretend play. The entire set is made of wood and measures 12x9 inches. This package contains one puzzle. Available in a variety of themes (each sold separately). Recommended for ages 2 and up.